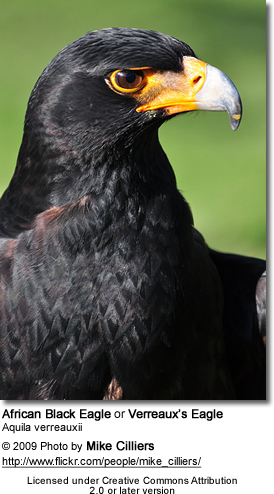 Verreaux's Eagle (Aquila verreauxii), also known as the African Black Eagle or Black Eagle, is a large bird of prey. Its name commemorates the French naturalist Jules Verreaux. This eagle is a resident breeder throughout Africa, especially sub-Saharan Africa, and can usually be found in mountainous regions. It is about 75 to 95 cm (30 to 38 in) in length, average weight for male is 3.7kg (8lb 02oz) and for females 4.5kg (9lb 14oz) and has a wingspan of up to 2 m (6.7 ft). It is generally black in colour with a distinct white V marking on its back. Juveniles are usually light and dark brown in colour with a black face. Structurally, it is very similar to the Golden Eagle of the Northern Hemisphere, and the Wedge-tailed Eagle of Australia. 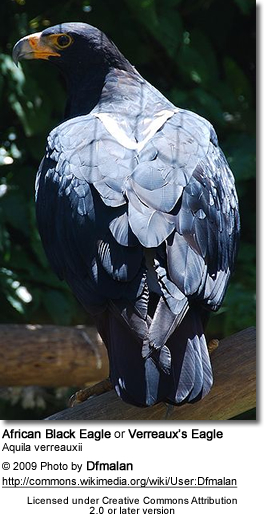 It is highly territorial and can often be seen with another Verreaux's Eagle, with whom it mates for life. The pair will lay two creamy white eggs, four days apart in autumn, and these will hatch approximately 45 days later. It is a specialist hunter of hyraxes (or dassies). The size of its territory often inversely reflects the size of the local hyrax population. Occasionally, it will prey on birds such as guineafowl or mammals of similar size to hyraxes, such as large rodents.